Bus from KL to Segamat is the favourite choice of transport for local commuters. Train from KL to Segamat is used to be one of the options for locals. However due to the ETS upgrading service and transit requirement at Gemas, many opt to take bus from KL to Segamat which is faster and more convenient direct service. KKKL and Transnasional are the two reputable operators providing bus from KL to Segamat. KKKL is the strong express bus brand with quality service in Malaysia, whereas Transnasional is Malaysia largest bus company backed by government with reliable service. Another highlight is that KKKL hourly bus from Kuala Lumpur to Segamat, starting from morning 8:30 to evening 18:30, offers a wide selection of departure timing to passengers. The frequent bus schedule is one of the reason why local commuters opt for bus service instead of train service. 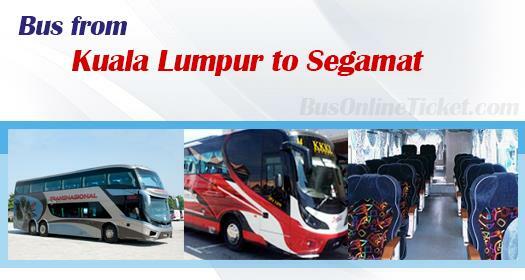 Duration required for bus from KL to Segamat takes about 3.5 – 4 hours depending on traffic condition. Because of no toilet facility in the bus, which is the norm in Malaysia, the coach would have a stopover along the highway for toilet break. Bus fare for KL to Segamat costs about RM 18.40 per ticket. Bus departs from Kuala Lumpur TBS (Terminal Bersepadu Selatan) which is the newly-built modern bus terminal after closure of Pudu Raya in November 2015. TBS is at Bandar Tasik Selatan, just south of Kuala Lumpur central. Travellers could connect to TBS by taking LRT and stop at Bandar Tasik Selatan Station. The coach terminates at Segamat bus terminal which is located at the town centre and diagonally opposite to Segamat KTM train station. Passengers are advised to book ticket online in advance with BusOnlineTicket.com especially during the weekend and holiday season. Online payment can be done securely by either credit card or internet banking.